Area51℠ can help you accomplish your supplier diversity objectives and company goals, while creating a collaborative advantage for your company. Through our collaborative approach, we assemble a team with the experience and expertise to understand your objectives, goals and unmet needs. As we work together and share perspectives, we design and implement innovative solutions to enhance your value chain. We are an extension of you; providing leading technology, innovative solutions, and passionate support to accomplish. Let's collaborate, to accomplish and to promote diversity. According to the National Minority Supplier Development Council (NMSDC) a MBE is defined as "ownership by minority individuals means the business is at least 51% owned by such individuals or, in the case of a publicly-owned business, at least 51% of the stock is owned by one or more such individuals i.e. the management and daily operations are controlled by those minority group members." Area51℠ is classified as Asian-Pacific (60%); U.S. citizens whose origins are from Vietnam. The disadvantaged person or person must be socially disadvantaged and economically disadvantaged. The firm must be small, according to SBA's size standards. 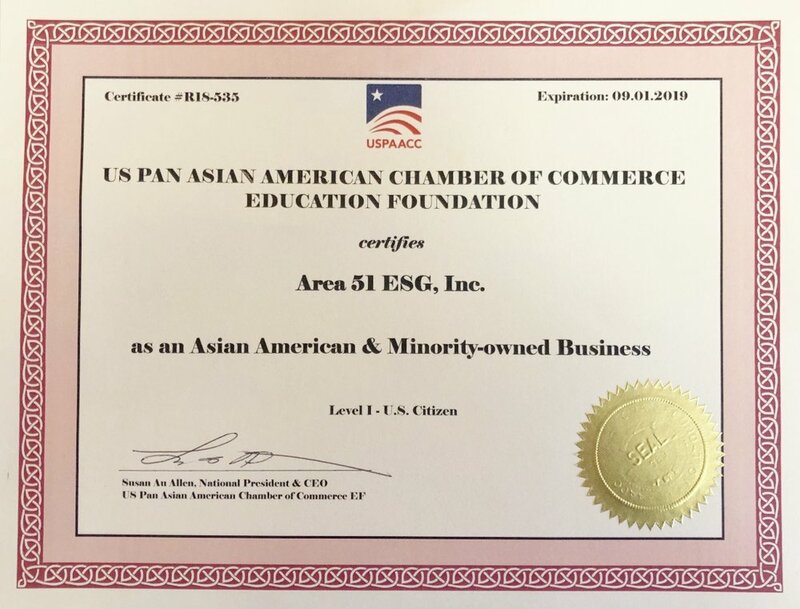 Area51℠ is certified by the US Pan Asian American Chamber of Commerce Education Foundation (USPAACC) as an Asian American & Minority-owned Business.